If you are looking for the Lemon Icebox Pie Recipe it’s here. This basic crumb crust recipe is versatile — you can use any of your favorite cookies, crackers, or even pretzels to create an easy no bake crust for pies, cheesecakes, and bars. Looking for something more? Try my easy, 2 ingredient Oreo Cookie Crust! I love the relaxed pace of summer. I love finishing up an assignment for a client or myself and then relaxing out in the pool. Having no thyroid gland means I am cold all the time except in the summer. Everyone may complain about 100F heat but not me — I am reptilian I suppose. I love it. Well, I love it except when I want to make dessert. I hate, hate, hate running the oven in the summertime. Ick. even though our house is large and has a huge kitchen area with high ceilings the kitchen gets crazy hot in the summer, especially when I am baking. 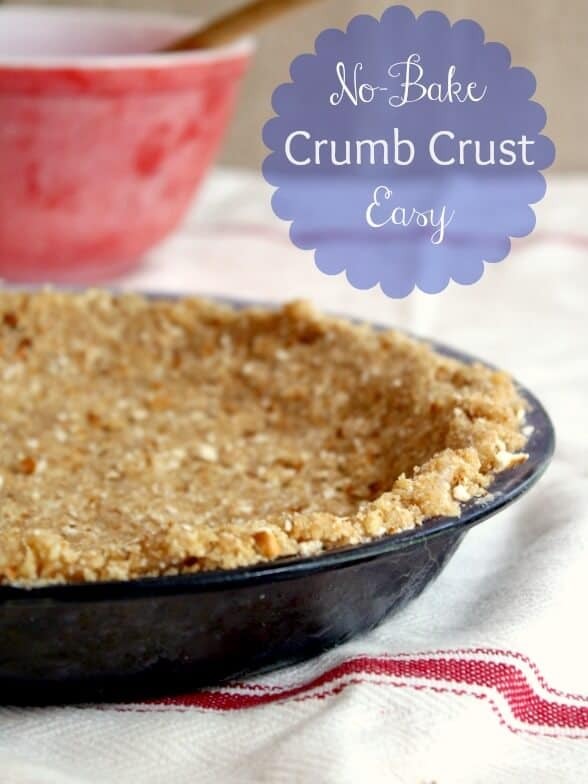 This no bake crumb crust is a lifesaver! No bake crumb crust is absolutely perfect for pies, cheesecakes, and bars. You can make it out of any type of cookie or cracker plus you can combine different kinds of crumbs to get unique and personalized flavors. 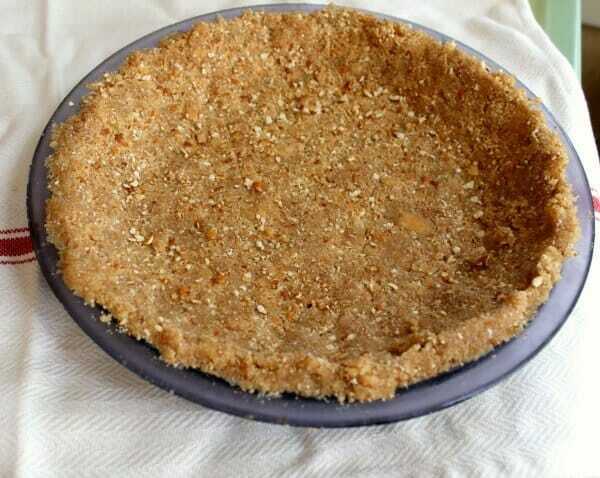 For example, I made a lemon icebox pie with this crust and I used pretzels and Nilla wafers for the crumb mixture. It was sweet and salty goodness! Don’t be afraid to add 1/2 teaspoon of cinnamon, cloves, ginger, or another favorite spice. Vanilla and other flavorings can be added with the butter, too. This is a blank canvas crust recipe, y’all. Don’t be afraid to make it your way! You can even use finely ground nuts as part of the crumbs! You get the idea. You’ll think of so many more! This easy crumb crust recipe is completely unbaked. Freeze it for 30 minutes or so before filling it and be sure to chill your pie thoroughly after filling. It may crumble a bit when you cut slices but it’s so good that no one will care. An easy crumb crust that doesn't need to be baked. Just chill and fill! Use your favorite cookies or crackers to create unique combinations. Add cinnamon, ginger, or other spices to make it even more special! Put crackers and sugar in a bowl. Firmly press the mixture over the bottom and up the sides of a 9-inch pie plate. Chill for one hour minimum or bake at 325F for 10 minutes. The easiest way to make crumbs is to put the cookies or crackers in a blender or food processor. The actual amount of cookies/crackers needed will be different for each variety of cookie or cracker. *Nutriton info was calculated using graham crackers. It will vary depending on what kind of crumbs you are using. I would like to make mini pumpkin pie. Similar size to two bite brownies. I read that the pie crust may crumble a bit when cutting. Since I wont be cutting these but essentially popping them out of the small tray do you think the crust will crumble or hold firm since its in a smaller base with no cutting? Any suggestions?